Tart-tongued and shrewd, Blanche is unique in the field of amateur sleuths: a queen-sized, middle-aged black woman rooted in working-class America. In her latest adventure Blanche gets suckered into standing in as cook-housekeeper to Allister Brindle, a Boston Brahmin politician, and his do-gooder wife. Blanche is quickly enmeshed in a scandal that moves from the Brindles' house (a.k.a. Prozac House) to her own black community as she tries to figure out the truth behind the death of a young black man. 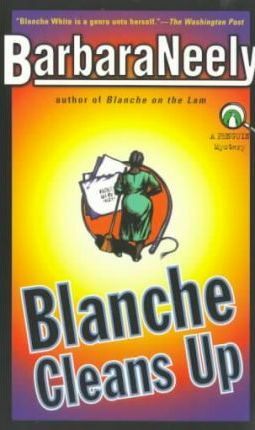 Hot on the trail, she encounters a love triangle with bent angles, teen pregnancy, phony spirituality, and at least one person who doesn't mean her any good.In Blanche, BarbaraNeely has created a heroine to cheer for -- and Blanche Cleans Up will thrill not only ardent Blanche fans and mystery buffs, but also anyone eager to explore a new neighborhood with a feisty, funny black woman as their guide.